Pets can't say how they're feeling. It's usually how they look or act that tells you something is wrong. You play a key role in helping your pet combat illness and stay as healthy as possible. 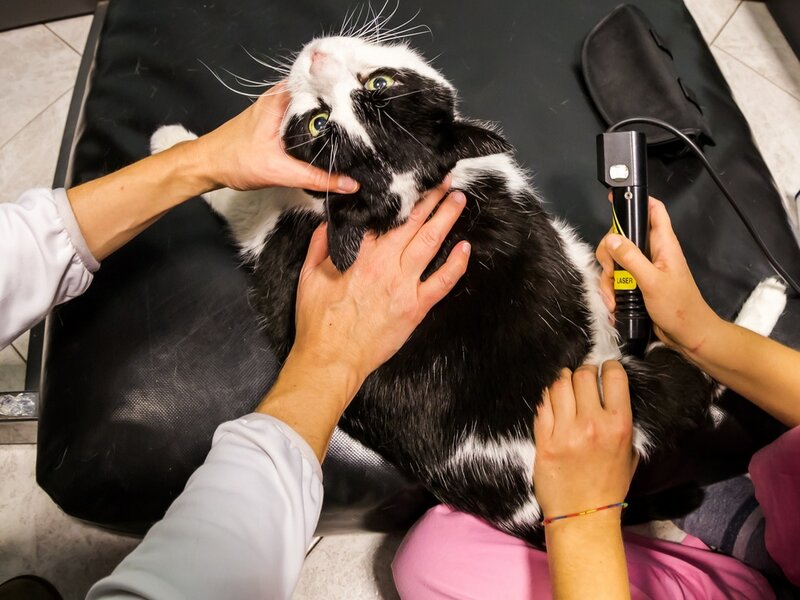 Awareness of the warning signs and regular preventive health screens, including physical exams and blood work, are the best ways to ensure that your pet lives a long healthy life. ​Blood testing can frequently detect illness in your pet before we see any outward signs of disease. Testing gives us immediate insights that we might not otherwise discover. We recommend that blood work be run on an annual basis, or more often when monitoring certain medications. The tests most recommended are a CBC (Complete Blood Count), Blood Chemistry Panel, Urinalysis and Thyroid Function Test. We also recommend blood work before any anesthetic procedures. Blood work could also be recommended when the patient is sick or has an emergency, as this gives the Doctor a snapshot of the pet's health. Our goal is to make sure your pet lives a long and healthy life. Lasers are a minimally invasive alternative to traditional surgery. Lasers replace scalpels in many procedures, and are useful for a wide range of conditions, such as cyst, tumor, and wart removal, and declawing. Laser procedures result in less pain; less bleeding and less swelling. They reduce risk of infection and result in less post-operative discomfort. ​Therapy laser is a alternative tool used for any type of inflammation in the body. The most commonly used injuries we treat, are cranial cruciate ligament tear, intravertebral disc disease and any type of arthritis. The therapy laser relieves pain and inflammation with out unnecessary drugs.